Happy National S'mores Day 2012! Here's how we celebrate it around here. [By Nick] Growing up, I use to love to go camping. Okay that was a lie; I hated camping with a passion. Being eaten alive by bugs and lacking indoor plumbing was not appealing to me. The only reason I wouldn’t object to going was that I knew we would be making one of the greater desserts of all time, s’mores. Sure nature is beautiful and all but it’s nowhere near as beautiful as the sight of a perfectly crafted s’more. I would seriously make sure that we had the ingredients packed or I would refuse to move until they were acquired. Looking back on it, I was a complete brat but I was the youngest so leaving me behind wouldn’t have been the smartest idea. 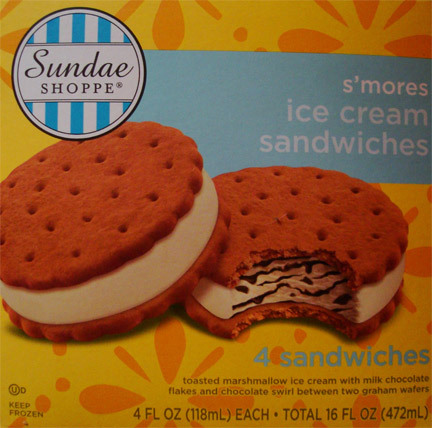 I’ve been disappointed with most ice cream representations of the classic dessert so I was a bit hesitant when I saw these sandwiches at my local Aldi. For those who don’t know, Aldi’s is a lower end grocery chain that specializes in keeping prices low by selling mostly in house items. They are kind of like Trader Joe’s except not as high quality. Seeing as these were a special buy, aka limited edition, I knew I would hate myself if I didn’t give them a try before they disappeared. So with a little hesitation, I threw these into my cart and on my way I went. The description is what truly sold me on these. We’re off to a good start with the clear packaging. From looks alone these seem to be your average vanilla ice cream sandwich. Nothing really sets it apart out of the gate but once you take a bite you realize you’re in for a surprise. The toasted marshmallow ice cream is spot on. It’s as if they decided to roast some marshmallows over a campfire and then decided to let them chill overnight. The chocolate swirl is prevalent throughout the sandwich and resembles the flavor of Hershey chocolate syrup. It is just your run of the mill milk chocolate with no signs of bitterness. Now I know that’s not a big compliment normally but in this application it works to bring back some nostalgia. The chocolate flakes add a bit of crunch but don’t really distinguish themselves from the syrup in terms of taste. I have no problem with this because my main gripe with s’mores ice cream sandwiches is that they always seem to lack any added texture. You have a nice consistent crunch with these and I appreciate the addition. Now for the not so great part, the graham wafers. The graham flavor is very subdued and is only there if you’re trying to pick it out. Clearly it’s not trying to be the star but it’s not even trying to be a supporting actor. It’s more like the guy who cleans up after the performance is over. 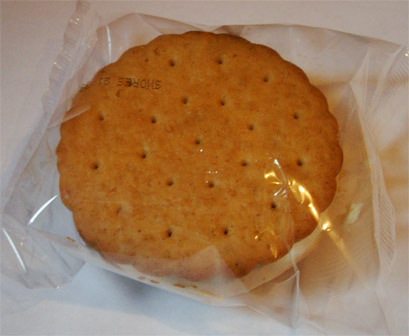 My major gripe with these sandwiches it that the wafers really enjoy sticking to your fingers. 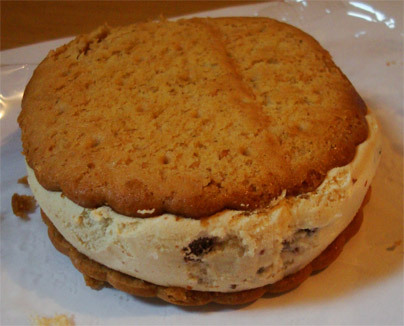 There’s nothing I hate more than an ice cream sandwich that is messier than it needs to be. Still even with the subpar wafers, these sandwiches are top notch when it comes to emulating the dessert they’re named after. Verdict? If they were to improve the wafers these would be one of my all-time favorites. Buy Again? Hopefully they’re still some left next time I go shopping. 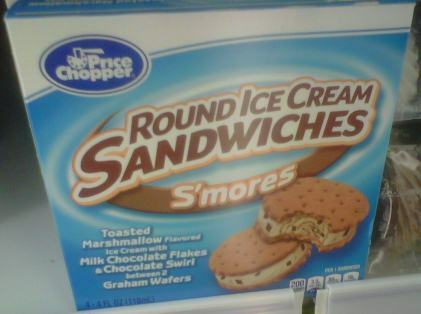 Dec 2012 Update: Nick was at Price Chopper and spied these S'mores Round Ice Cream Sandwiches. I can't wait to try them for myself! As I checked on Aldi's website, it dawned on me they just built one of these in Worcester. You know I'm a sucker for any kind of frozen s'mores treat, so I think I'm going on a field trip!